When the largest coal producer in China puts out the kind of numbers China Shenhua Energy Co. just reported, it’s an unmistakable signal that the most populous country on the planet is continuing to step back from coal. It sees a 10 percent drop in its domestic coal sales in 2015 (that’s a 47 million tonne reduction to 404 million tonnes). Its capital expenditure plans for coal and power generation in 2015 are down 25 percent over 2014 to $3.2 billion. It expects its ports and rail investment to drop 12 percent year-over-year to $2.5 billion. The numbers reveal a strategic shift by Shenhua as it reduces its volumes, its operating costs and its capital spending, and the 2015 numbers in particular signal an acceleration in this strategy. These trends are bigger, actually, than Shenhua. The company has a 15 percent share of the Chinese coal market, so it’s a key barometer of the larger picture, and its cutbacks send a clear signal that China is intent on curbing its emissions by a rapid diversification away from coal. Gone are the days when Bill Raney, president of the WV Coal Association, can claim that the US doesn’t have to do anything about carbon emissions, because China isn’t. Gone are the days when Mr. Raney can claim that WV coal miners will be back at work soon exporting coal to Germany and China. Real world economics have caught up to the coal industry and no amount of US or WV government subsidies can save it. According to The Global Status Report, which was released earlier this month by the Renewable Energy Policy Network for the 21st Century, China once again led the rest of the world in renewable energy investment in 2013, spending a total of $56.3 billion on wind, solar and other renewable projects. The report stated that China accounted for 61 percent of the total investment in renewables by developing countries, and that China invested more in renewable energy than all of Europe last year. I’m sitting here in my office pondering a conundrum. Back in 2013, the WV PSC granted Ohio-based power company holding companies AEP and FirstEnergy the right to add significant new charges to WV electric bills to cover the costs of a new right-of-way maintenance program that would reduce the regular blackouts that hit West Virginians. The PSC just granted FirstEnergy’s Mon Power and Potomac Edison a new base rate increase which includes the cost of this program that was supposed to increase system reliability in WV. Mon Power and Potomac Edison rate payers are now paying a surcharge that will bring in $50 million a year to the power companies for supposedly enhanced right-of-way maintenance. Yesterday morning, with Mon Power’s electricity still coming in through my meter, I thought that maybe WV rate payers might actually be getting their money’s worth. FirstEnergy has made a big right-of-way clearing push in Calhoun County in the last two years. They have even illegally sprayed my neighbors with herbicides. Well, I was wrong. Yesterday (Friday), just after noon, Mon Power’s power went down. We have 15 solar panels, 8 six-volt batteries and lots of sunshine today, so we have plenty of power. Back in 2013, the PSC and the power companies told us everything would be fine if West Virginians just forked over more money. Guess what? This recent storm has knocked out power to over 100,000 customers. How have things changed? If you want to see a history of my posts on this subject, click here. Where Did the Term “Cross-Subsidization” Come From? Before we tackle “cross-subsidization,” we need to clarify this sentence a little bit. The word “tariff” refers to the rules and terms that the PSC approves for adjusting or crediting the electric rates of net metered customers. The term “class of service” refers to the three classes into which electric customers are divided in West Virginia: residential, commercial and industrial. The Folk amendment does not address “cross-subsidization” across rate classes, just within each class. In other words, this sentence seems to say that all customers in a specific class must be treated the same. But, is that true in any other situations besides net metered customers? The answer is a definite “no.” While claiming to treat all customers the same, Del. Folk’s amendment in fact singles out net metered solar power system owners for punishment. “Cross-subsidization” among rate payers is baked into our regulated monopoly system in West Virginia. FirstEnergy’s two WV subsidiaries just settled a base rate case with an 8.8% rate increase for residential customers. A big part of that increase comes from new charges the PSC allowed FirstEnergy to recover from rate payers. Those charges are for costs that FirstEnergy has, and will be, incurring for expanded clearing of power line rights-of-way. FirstEnergy has to do a lot of right-of-way clearing for rural customers here in Calhoun County. We get a lot of this kind of benefit, yet we pay exactly the same electric rates as someone who lives in the middle of Morgantown, where there are hardly any trees. That is “cross-subsidization,” yet the Legislature has passed no law that prevents this kind of “cross-subsidization” which is arguably much less fair than the balance of benefits and costs that net metered customers create on FirstEnergy’s system. This is just one example of the “cross-subsidization” that has been part of rate making in WV for decades. East Virginia electricity blogger Ivy Main wrote extensively about this issue when AEP and Dominion Energy succeeded in undermining net metering in East Virginia by imposing “stand by” charges on their retail customers. Want to see the worst form of “cross-subsidization between customers within one class of service” that has been around for decades in WV? Take a look at Appalachian Power’s residential rate schedule. Go to this link and go to page 43 of the .pdf file. Yes, you read that right. APCo customers who use less than 500 kwh per month provide a heavy subsidy, in the form of higher electric rates, to th0se people who use more electricity. If “cross-subsidies” are already a way of life in WV electric rate making, why did Del. Folk, as well as the new leadership of the WV Legislature, think that net metered solar power producers deserved to be punished? Keep in mind that the words “cross-subsidization” do not appear anywhere in current net metering laws or in the PSC’s rules on net metering. Two documents tell the tale. 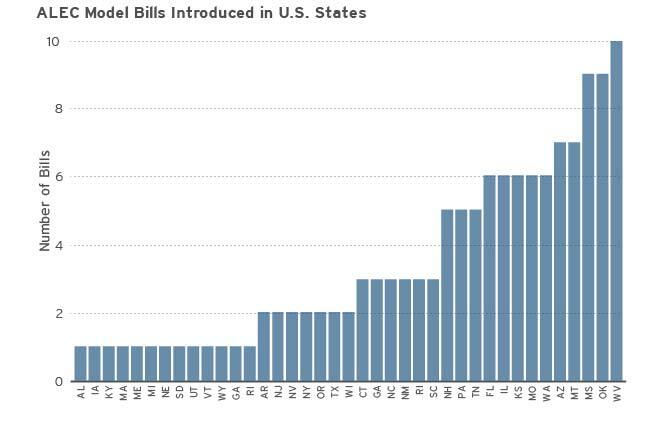 Here is a recent article from Molly Jackson at the Brookings Institution that shows that more “model legislation” created by the American Legislative Exchange Council is introduced in the WV Legislature than in all other US state legislatures. ALEC is an industry lobbying organization backed by AEP and the Edison Electric Institute, the electric industry’s trade association, and is dedicated to radically altering state government to serve industry interests. ALEC has clearly targeted legislators like Del. Folk. Isn’t it interesting that the language of Del. Folk’s “cross-subsidization” amendment so closely mirrors the language in this paragraph from the introduction to ALEC’s report? Also note the false assumptions in the paragraph’s first sentence. When net metered customers need electricity, they use and pay for it just like all other customers in their rate class. When solar power producers generate more electricity than they need, their electricity passes out through their meter and into the houses of their nearest neighbors. Try as they might, ALEC can’t change the laws of physics. At most, this transfer uses a few hundred yards of a single distribution circuit, a cost easily offset by the fact that power sharing through net metering reduces the need for future grid expansion or centralized power plants. Like Del. Folk’s “cross-subsidization” amendment, ALEC’s claim that net metering penalties are based on “fairness” is in fact a windfall subsidy to power companies forced on net metered customers. West Virginians need to ask their legislators why they are doing the dirty work of out-of-state corporations to penalize one of the most innovative and dynamic sectors of the WV economy. The Public Utility Commission of Ohio has told AEP that is will not allow the company to lock Ohio rate payers into power purchase agreements with AEP’s uncompetitive coal burners. FirstEnergy also has a similar bail out plan pending before PUCO. The Public Utilities Commission of Ohio made history Wednesday in a ruling refusing to allow AEP Ohio to saddle ratepayers with extra charges to subsidize the continued operation of a 1950s-era coal-fired power plant that it owns along with FirstEnergy and other state utilities. The decision to reject AEP’s request for a subsidy — immediately applauded by some consumer and environmental groups — sends a shot over the bow of FirstEnergy’s similar proposal and could jeopardize the continued operation of the Davis-Besse nuclear power plant and the W.H. Sammis coal-fired power plant on the Ohio River. The Ohio Consumers’ Counsel has opposed the PPA proposals offered by both utilities. And it lost no time Wednesday arguing that the real issue in the case is the impact on home electric bills. “AEP’s customers already pay the highest electric rates in the state. Ohioans pay higher rates on average than consumers in 31 other states,” said OCC spokesman Scott Gerfen. “Ohio’s electric utilities want the protection of more government regulation but consumers need the protection of more competition to lower their electric bills in this era of historically low energy prices. Still, Wednesday’s ruling is not absolutely a death knell for power purchase agreements, despite the hosannas issued by other consumer groups and some environmental organizations soon after the ruling. In fact the PUCO order declares that the concept of a PPA in a marketplace that is supposed to be free of state regulation is legal under Ohio law. What the order says is that the commission could find no benefit to customers in allowing the PPA as it was proposed by AEP Ohio. “Although the magnitude of the impact of the proposed PPA rider cannot be known to any degree of certainty, the Commission agrees with the Ohio Consumers’ Counsel, the Industrial Energy Users-Ohio and other intervenors that the evidence of record reflects that the rider may result in a net cost to customers, with little offsetting benefit from the rider’s intended purpose as a hedge against market volatility,” the ruling asserts. Unlike the WV PSC, PUCO is interested in protecting electric customers. As time goes on, the WV Harrison (FirstEnergy) and Mitchell (AEP) deals will look worse and worse, compared with PUCO’s wise decision. AEP and FirstEnergy want $121 million (and more) from all rate payers in PJM Interconnection to cover their stranded capital costs (the abandonment case) and operating costs (the formal challenges case) on the failed PATH transmission project. Remember that this boondoggle was created by the Energy Policy Act, inspired by the Cheney administration, and passed by the Republican Congress in 2005. The 2005 Energy Policy Act allowed certain anointed transmission projects to charge all their costs to rate payers, even if they were never built – a good deal for power companies, not so good for rate payers. You can’t find a better example of money for nothing. While I am still technically an intervenor in the PATH abandonment case at FERC, I am no longer an active participant. Last Friday was the deadline for testimony by the remaining active participants in the cases: Keryn Newman and Ali Haverty in the formal challenge case and a group of state public service commissions and consumer advocates (with the conspicuous exception of the WV PSC) as well as the staff of FERC itself. Pro se intervenor Keryn Newman filed testimony on behalf of herself and my neighbor Alison Haverty in their formal challenge to expenses charged by PATH to rate payers from 2009 to 2011. As they have all along, Keryn and Ali maintained in their testimony that PATH charges for lobbying and fake front groups should be borne by AEP/FE shareholders and not PJM rate payers. Here is a link to their testimony. FERC staff analysts also filed their testimony last Friday. Staff witness Jean Miller appeared to agree with Keryn and Ali that PATH had illegally charged rate payers for their PR and lobbying costs. Keryn’s and Ali’s challenges only covered the years 2009-2011. Ms. Miller testified that PATH’s 2008 costs should also be refunded to rate payers. Here is a link to Ms. Miller’s testimony. FERC expert Craig Deters also filed testimony that fills out the evidence Ms. Miller presented. Here is a link to his testimony. Staff witness Robert Keyton attacked testimony provided earlier by AEP/FE concerning the return on equity and debt costs that they were proposing the charge rate payers. Most of this discussion is pretty abstruse and, as Mr. Keyton himself points out, largely hypothetical, because the front companies for PATH created by AEP/FE never produced anything and never borrowed any money, and are now defunct. Here is a link to Mr. Keyton’s testimony. The state agencies also filed some excellent testimony by transmission expert Peter Lanzalotta. Mr. Lanzalotta basically testified that the AEP/FE should have pulled the plug on PATH after the East Virginia State Corporation Commission rejected the companies’ claim that PATH was needed to resolve reliability problems on the PJM system. Mr. Lanzalotta concludes that PATH’s recommendation to Virginia that PATH be allowed to proceed while waiting for the 2010 RTEP to determine the need for the Project was not prudent. If PATH had successfully recommended that it would be prudent to suspend the Project at the beginning of 2010, at least a year earlier than it actually was, then the abandonment costs would have been about $29 million lower than they actually were. Beyond PATH’s 2010 recommendation that it be allowed to proceed, the escalation of PATH’s costs from its inception through its multiple delays were in excess of typical transmission cost escalation over the same period. Based on the Handy Whitman Cost Trends for Electric Utility Construction, the amount of excessive spending on the PATH Project is estimated to be $4.3 million. The reference to prudence is important, because FERC rules require that rate payers can only be charged with costs that were prudently incurred by the power company. Mr. Lanzalotta is saying here that more than $30 million for which AEP/FE want to charge rate payers violates FERC rules, and must be paid only by AEP/FE shareholders. This point has been made repeatedly throughout the case by me and by other intervenors. Mr. Lanzalotta sums it up nicely. You can see his testimony at this link. Those of you who fought the PATH line in the WV PSC will appreciate the testimony of Randall Woolridge, on behalf of the state agencies. Mr. Woolridge provides an analysis of the exorbitant legal costs for which AEP/FE are trying to charge rate payers. The power companies had the gall to redact important information from the records they provided to the state agencies in discovery. Mr. Woolridge states that his analysis was incomplete, because he only received the unredacted copies of lawyers’ records two days before his testimony was due. The final hearing in this case, dockets ER09-1256 and ER12-2708, isn’t until March 24, 2015. A final decision by the Commission is due on July 31, 2015.